As we saw previously with the spectacular Mad Men-themed episode of “Chris Hardwick’s All-Star Celebrity Bowling,” nothing brings out a comedic web series’ full flavor like a little dash of Hamm. Now musical comic/weirdo Reggie Watts is testing this theory further with the first installment of “Reggie Makes Music,” a web companion series to the upcoming IFC show Comedy Bang Bang (premiering June 8), in which he and CBB guests improvise musical interludes. 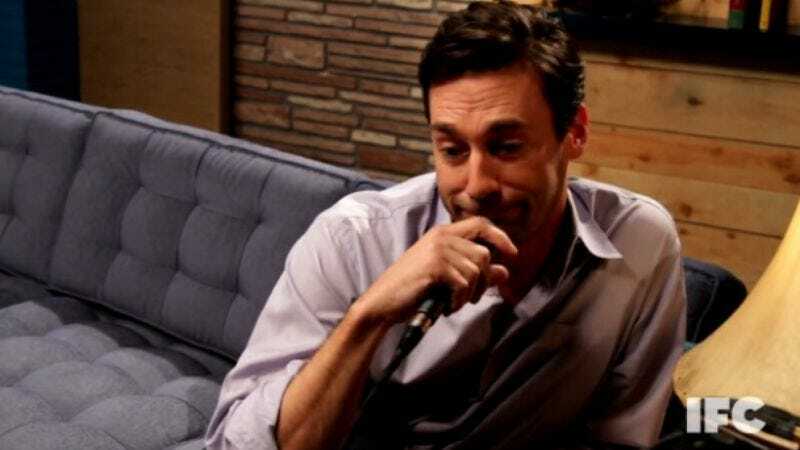 First up is inveterate swell guy Jon Hamm, who brings his freestyle… well, not skills… let’s say freestyle gameness to bear on Watts’ loopy loops for a Taxi-themed jam, throwing in a pretty spot-on Christopher Lloyd impression and a thoughtful reconsideration of the series’ later seasons for anyone who needs further convincing that Jon Hamm is The Best.